"You inspire us all," Robertson told the real estate mogul, who has secured the endorsement of Liberty University President Jerry Falwell Jr., and is bringing in evangelical voters to his camp. 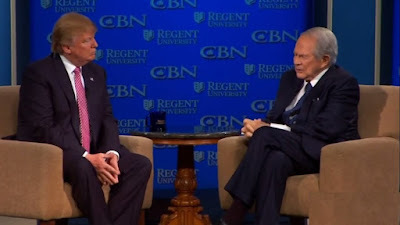 Christian media leader Pat Robertson, who 28 years ago ran for the White House in his bid to reform America, had a message Wednesday for the 2016 Republican presidential candidate whose campaign has set political fires ablaze across America. “You inspire us all,” Robertson told Donald Trump during an appearance at Regent University in Virginia. 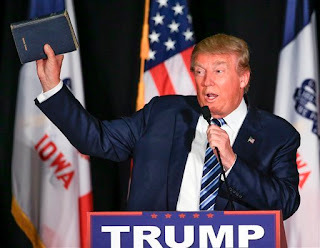 During his appearance, Trump cited his book “The Art of the Deal,” as a great book, but told his Christian audience that the greatest book is the Bible. “Kerry did not read the Art of the Deal. Probably not the Bible, either,” Trump said during a conversation about Secretary of State John Kerry. Robertson asked Trump what criteria he would use in nominating a successor for Justice Antonin Scalia. “Pro-life,” Trump replied. “We want– It starts with that, starts with it. A very conservative, a very, very smart, I mean like Judge (Antonin) Scalia would be a perfect. He was a perfect representative.” “I’ve always said that Justice (Clarence) Thomas doesn’t get enough credit. He is a wonderful man, a wonderful guy and I’ve always said Judge (Samuel) Alito is a terrific guy. So, in that realm is what we’re talking about for me,” Trump said. Trump also discussed Middle East affairs. Trump also took a jab at Democratic presidential candidate Hillary Clinton. Trump said the president should bring government to a consensus on issues and move forward, something President Obama has been unable to do.